With a bit of help from the #geotools IRC channel (thanks Micheal Bedward) I have gotten around to hooking up Eclipse with the "normal" Mac OSX JDK. The normal JDK is actually a bit hard to find; as it requires a separate download. The location of the JDK has also recently moved leaving much of the documentation out of date. Lion does not come with a JDK; you can go and download one directly from http://connect.apple.com. Yes you need to sign up and login with your apple id. The download column is over on the right; and you should be able to find your way. The jdk is installed into a different location then pervious. This will result in IDEs (such as Eclipse) being unable to locate source code and javadocs. Please go ahead and have a look to confirm where your JDK ended up; this will no doubt change over time. At the time of writing the Search button was not aware of the new JDK location; we we will need to click on the Add button and hunt it down ourselves. You can now developer normally with javadocs correctly shown for for the base classes like java.lang.String, source code correctly shown when debugging. Just pick the right MAC Lion installation file from the Eclipse site and you will be fine, with no extra installation issues. hello I just migrate from windows to mac, I was using eclipse in windows and now using cold fusion builder, Can I develop coldfusion with eclipse(aptana) with this instructions? 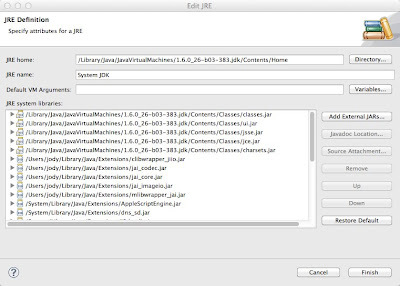 After installing the JDK for Mac OSX I created some symlinks to make it work. Note: Replace 1.6.0_32-b05-420.jdk with the version you installed. i wont able to connect with oracle weblogic server it doesnt find path of jdk in mac os xlion what to do now ?